What kind of a small ship? Please tell me which kind of a ship (and about which approximative dimensions/ tonnage) could have been a little smugglers' ship (in early 1700s) which could be sailed in 2-3 men? 50 tons? more? less? and what kind? One-masted sloop? Pinnace? Something else? when you say smugglers vessel is it open ocean worthy or one of coastal size used for fishing or a coastal trader that would be local to the area and launched to meet a larger vessel off the coast. at jamestown we have a 40 ton vessel "Godspeed" it needs a crew close to 13men then their is the "Discovery" 20ton a crew of 9 men, the reasons for the size of the crews is the men need a break to sleep and eat. you could get by with about have the men if it needed to only sail out for a day or so in fair weather. In general, few masts equates to smaller crews. Of course, this is only true until the masts get so big that more people are needed to hoist the sail than to actually sail it. Then, multiple smaller sails on more masts is more crew-efficient. Of course, small coastal fishing smacks (say sloop or cutter rig) can be sailed by 2-3 men, and in the 19th Century I know some small schooners were even crewed by 'two men and a boy', but it created a lot of extra risk if adverse conditions were to come up. There was no autopilot of any nature at the time, so there always needed to be someone at the helm while underway. A lot of work can be done by a relatively small crew, but only in the short term. I remember as a new crew member on the Lady Washington (1750's, 90 ton brig, usually crewed by 12 or so today, probably more back then even when rigged as a sloop) for a day or two we sailed with only 5 crew (including captain and cook). It was a lot of work, we didn't set too many sails for us to handle, and we could rely on the engine/docking instead of hauling up the 1200 lb anchor and only were doing 3 hour sails at a time. It would have been exhausting going for days on end like that, as nearly every sail adjustment would require someone getting up from their off watch. In another comparison, the North Star of Herschel Island is a full rigged ship of 30 tons (though built in 1935, so far OOP) that boasts the ability to be sailed single handed (so 2-3 crew would be fairly reasonable). However, for a smuggling ship they usually rely on speed. Sailing that short handed doesn't allow you the ability to trim sails constantly like a racing crew in order to get as much speed as possible. If, as mentioned above, a crew was just meeting a vessel offshore and transferring some cargo to smuggle ashore, then 2-3 crew is reasonable for essentially an overnight or maybe couple day journey on a small (30 ton or less probably) fishing sloop or schooner. For open ocean at that time, it's just too small of a crew for anything reliable or even halfway safe. Remember that with natural fiber rigging, it had to be almost constantly adjusted, as opposed to even replica boats these days which are able to keep good tension with wire rigging (possibly covered with fiber rope to keep period appearance). No, it wasn't to just transfer the load. It was for going between, let's say, Jamaica, Hispaniola and Cuba (or other islands around) because you know there were trade monopolies and even at peace time the neighbouring islands colonies of different countries couldn't trade among themselves. So the trips might have been about one week go-one week return in average (with shorter trips 3-4 days possible too). In this case... how little the ship could be to be still navigable and how many (ie how few, my question is for the smaller side, but still safe) crewmen needed? 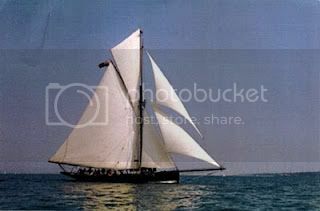 did some looking around, there is a style of small sloop used in inter-island trade known as the "Tortla sloop" found a picture showing it being crewed by four men. google (tortla sloop)look for pic of the old wooden one don't get put off by the rich fiber glass copies. I know that smaller fishing schooners (< 50 tons) were crewed by as few as 5 men in the early 1700s, and shallops with probably fewer men. Sloops are normally single-masted vessels. When people talk about sloops from this period in the Caribbean, they usually refer to two different ones: Bermuda- and Jamaica- built sloops. (You will find a somewhat more detailed discussion on sloops this page of my article The Pirate Surgeon's Quarters in the Golden Age of Piracy.) 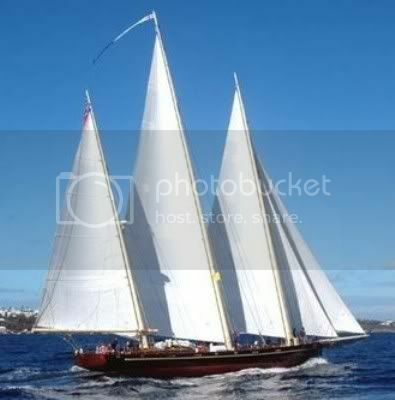 The image below is of a Bermuda Sloop. I haven't found an image of a Jamaican sloop. I recently found another image that contains a sloop in the Caribbean, although it is from 1783. The image can be blown up to see quite a bit of detail on this page of the JCB Archive of Early American Images. The sloop is in the upper left hand corner. You will note that both of these vessel show about a dozen or so men on board, however. I would think two or three pirates would be in a very small boat, such as a canoe or pirogue. The reason pirates would want a larger ship (such as a sloop) would be so that they could add more men and guns to their company since these were the two advantages they had over merchant ships. Our pirate ship, the "Rising Sun" is a strong and swift Bermuda sloop with three masts, 16 12-lber cannons (8 on port battery, 8 on starboard) and four 4 "long-nine" 9-lb chasers (2 abow, 2 astern). Before being a pirate vessel, it had been a merchantman from Martinique, named "Odelette". (The model photo being "Spirit of Bermuda) and the previous pirate ship, which got sunk by the allied Navy ships, was a pinnace. 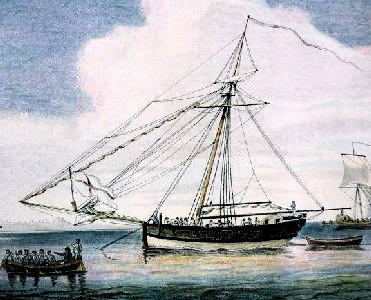 The smugglers' ship "La Guajira" is a one-masted Bermuda sloop,with a stiff deep hull, made of cedar, which gives it superior seaworthiness. The fore-and-aft rig is particularly useful in manoeuvring upwind, to escape from larger men-of-war, which, with their square rigs, could not sail as closely to windward. Such ships are renowned for their speed, maneuverability, and the expert seamanship of the highly skilled smugglers. It carries little fixed ballast, allowing for large cargo capacity, useful both for merchant ships and smugglers. What I saw about Tortola sloops show them too little... as in no room for a cabin and for a hold for smuggled goods. (But if I look better, apparently this sloop used for "La Guajira" doesn't show it either... and it doesn't mean there was none). The shallop involves oars... So yes, I might look for a Jamaica sloop, a Tortola sloop or a small fishing schooner, 40 tons or something. Schooners were two masted, weren't they? And I didn;t say I wanted it for pirates; I wanted it for smugglers, who might be of ...smaller caliber, and not willing many crewmates to share the profit with, if it makes sense. Only enough to be able to sail the ship.